This is an all metal radiator for 1968-1970 Austin Healey Sprites and 1968-1974 MG Midgets. High quality part made in the UK. These are the cross flow radiators as used on 1968 and later cars from AH (C) 72034 and MG from (C) 60441. Some cars have had the earlier vertical flow radiators installed sometime in the past so check to see what is installed in the car. How do you know if you have a cross flow radiator? 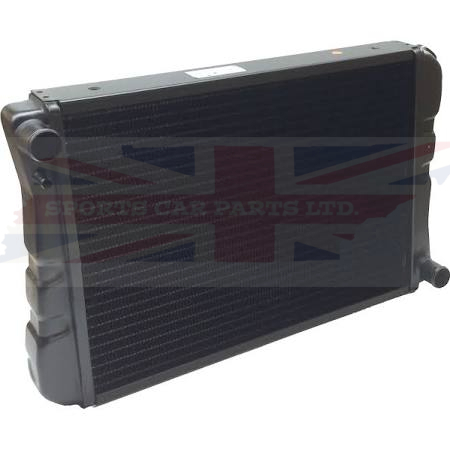 Take a look at your radiator, if you have a metal cross tube on the under side of the radiator which radiator fluid runs through, that is a cross flow unit. Or if the radiator has metal tanks on the side of the radiator fins it is a cross flow unit.